The governor spoke while swearing in his Special Adviser for the Bureau for Local Government and Chieftaincy Affairs, Jerome Torshimbe at Government House, Makurdi. His words: “Let party or ethnicity not divide us. As for party, I have been given red card and I am outside the pitch. So, I am a free man. I don’t know what will happen next but I’m waiting. Ortom expressed the hope that the current security challenges facing the state and residents would in no time be a thing of the past. He urged the people to avoid untoward activities and be steadfast in God. The governor tasked the new aide to discharge his duties creditably. However, APC’s National Chairman, Comrade Adams Oshiomhole has countered the governor’s claim. 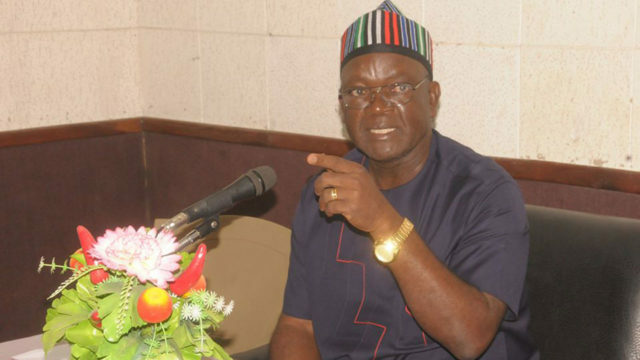 According to him, Ortom still remains a member of the party. Reacting to the purported moves by the governor to dump the party, he stated that it was untrue that the political group was frustrating him out of its fold. “I have since assumed the chairmanship of this party along with my colleagues in the National Working Committee (NWC) and I know of a fact that we have not shut out any governor and certainly not Governor Ortom.